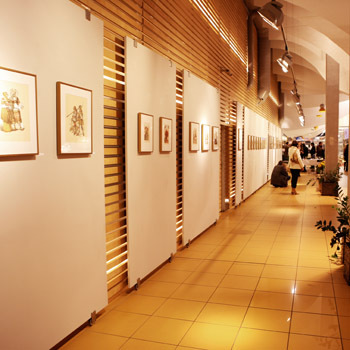 After my exhibit in Riga, I brought the show to Domus Gallery in Vilnius, Lithuania. In spite of a little logistical glitch pertaining to planning of the event, my quick-witted friends Lidija Rasutis, Daiva Taliute and Ruta Kaupinyte, stepped in and did everything so perfectly and efficiently that I was astonished at the result. Daiva and Ruta did the press releases and invited a lot of people as well as journalists. The show opened with classical jazz music played by my dear friend the best pianist in Lithuania Povilas Jaraminas and Lidija singing my favorite song "My Funny Valentine." The show turned out great!